You Against Me was a book I adored. It was really enjoyable and realistic too. I never read any books by Downham before so I really didn’t know what to expect. I’m glad I picked this up. It had a great storyline so I had no problem in getting into the world of Ellie and Mickey. 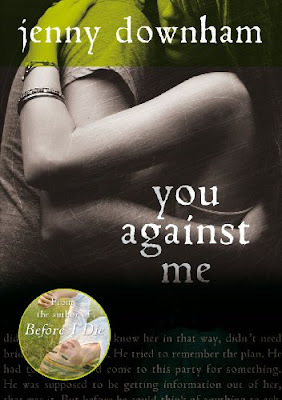 In You Against Me, Mickey discovers that his sister has been assaulted at a party and so his world comes crashing down. Meanwhile, Ellie life doesn't get any better as it is her brother who has been charged of the assault. When their two worlds collide, anything can happen. I completely loved Micky. I adore how much he loves his family and would do anything for them. Though, there were times that I had to question his actions but everyone has flaws. I just love reading about him and getting to know him better. Ellie is also another great character. She's very vulnerable yet very sweet. And so I just loved their scenes together. It's a love story and a great one too. I loved seeing their relationship grow and develop. The chemistry and everything is together, their simply perfect for each other. The story alternates between Ellie and Mickey but also gives us a great glimpse at their families. Their expectations and thoughts. Elllie and Mickey are from different worlds and it's a wonder to see how they would get along. Downham's writing is unbelievable good. It's completely honest and very real. You Against Me was so good! It's a fantastic novel. I'm looking forward to reading more books by Jenny Downham! Read this, you're missing out on something that's simply awesome! I really should read this! Thanks for the review! I liked the synopsis. Quite different. Great review and glad you enjoyed it! I really liked this book, too. And might even be inclined to pick up the author's debut some time soon. I especially love the cover:). I recently read this too, I loved SOO much!! It's so much better then Downham's first novel. Truly specular, the characters are really real. The book looked good, I think I'll mark it as a to-read. Definitely looks like an intersting book, think I'll give it a try. Powerful storyline. This sounds just like the kind of books I like to read. I am not familiar with the author, but love to find new authors to try.